Podgorica is the capital and largest city of Montenegro. It is located 44 meter above sea level. The city’s population is at 136,473. The favorable geographical position of Podgorica, at the confluence of the Ribnica and Moraca rivers, on the meeting point of fertile Zeta plain and Bjelopavlici Valley has made the city an attractive location for settlement. The city is situated only a few dozen kilometers from both winter ski centers in the north and seaside resorts on Adriatic Sea. The municipality of Podgorica accounts for 10.4% of Montenegro’s territory and 27.3% of its population. Besides being an administrative center of Montenegro, Podgorica is also its economic, cultural and educational focal point. The name literally means “under the Gorica” in the Serbian language; Gorica (meaning “little mountain”) is the name of the hill that overlooks center of the city. A former town (now ruins) named Doclea, existed in pre-Roman and Roman times and was located about 3 km northwest from Podgorica. The Roman Emperor Diocletian hailed from this region. In later centuries, Romans “hyper-corrected” the name to Doclea, wrongly guessing that an “I” had been lost due to vulgar speech patterns. “Duklja” is the later Slavic version of that word. When Podgorica was founded before the 11th century, it was called Birziminium. In the Middle Ages, the town was known as Ribnica before 1326, and between 1946 and 1992 it was called Titograd. Podgorica is located at the crossroads of several important routes that lead down to the city along the valleys of the rivers Zeta, Moraca, Cijevna, Ribnica, and Sitnica, in the ravine of Skadarsko Jezero and in the vicinity of the Adriatic Sea, in the fertile lowland with favorable climate conditions. The area has been suitable for human habitation since ancient times, with the earliest human settlements being founded in prehistory. The oldest remains of material culture on this area belong to the late Stone Age. 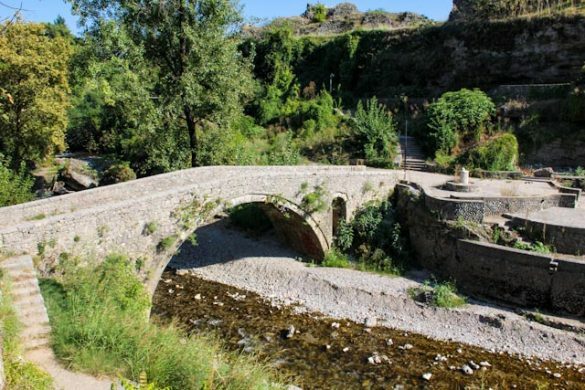 During the Illyrian age, the area of Zeta and Bjelopavlici ravine was inhabited by members of two Illyrian tribes, Labeates and Docleats, that directly influenced the genesis of local settlements. Labeati inhabited the area from Skadar to today’s Podgorica. They had their own fortress Meteon (now Medun), and developed organization of life, especially military. Dokleats also inhabited the valley of the Zeta River, and thanks to the fertile plain and favorable geographical and road position, experienced fast economic growth. Their biggest settlement was Doclea. The city was situated about three kilometers northwest from today’s Podgorica. From the urban point of view, Doclea was adapted to the terrain configuration. At that time it was a big city, with 8 – 10 thousand inhabitants, in which all core urban issues were resolved. A relatively high population density in an area with a radius of just over ten kilometers was conditioned by geographical position, a favorable climate, positive economic conditions and defensive positions that were of great importance at that time. Beginning in the 5th century, since the arrival of the first Slavic and Avar tribes and the beginning of the break up of the Roman Empire, the area bore witness to many noteworthy events. Eventually, the existing fortifications ceased their function, and new towns were created. Slavic groups that inhabited the area were in constant fights with Byzantium and tended to establish a new state. The result of the turmoil was establishment of a new settlement that was probably named after the river Ribnica on the banks of which it was erected. The first mention of Ribnica is related to the period of rule of Nemanjici. Geographical position conditioned route importance of Ribnica, as the crossroads of main road directions enabled connection of these areas with the West. When they finally inhabited these areas, the Slavs, by creating a new state, started developing their own culture and art. That culture was acceptable to the medieval church and feudal class. The name of Podgorica is mentioned for the first time in 1326 in one court document of the Kotor archive. Podgorica was economically strong. Merchant connections between Dubrovnik and the State of Nemanjici, well developed at that time, were maintained over the road that led through Trebinje and Nikšic to Podgorica. As it was sited on the busiest crossroads, Podgorica was the center of very vivid flow of goods, merchants, messengers and other passengers that augmented to its development, economic power, military strength and strategic importance. The Turkish occupation of Podgorica in 1474 interrupted the economic, cultural and artistic rise of the city. The Turks built up a huge fortress in Podgorica and the existing settlement, with highly developed merchant connections, turned into the main defensive and attacking bastion against the rebellious tribes. The fortified city, with towers, gates and defensive ramparts, enabled the Turks to resist all attacks. In 1864, Podgorica became a township (kaza) of Iskodra vilayet as Burguriçe. Pursuant to the decision of the Berlin Congress in 1878, Podgorica was integrated into Montenegro. That marked the end of four centuries of Turkish occupation and the beginning of new era in the development of Podgorica and Montenegro. The city has developed relatively fast and grew into a strong market. was devastated to the ground, with the deaths of over 4,100 victims. It was liberated on December 19, 1944. Under the name of Titograd, on July 13, 1946, it became the capital of the Republic. That marked the beginning of new life. In the period that followed a general transformation of the town was realized. Material, personnel and scientific – technical potential was increased, education experienced strong growth, many new cultural and health institutions were founded, and by modern roads and air connections the city became connected to the rest of the state and foreign countries. Titograd thus became the commercial, socioeconomic and cultural center of Montenegro. The name of Podgorica was reinstated on April 2, 1992. Nazi and allied bombing during World War II destroyed most of the old architecture, so Podgorica is mostly modern city. In the last decade it has been emerging as a modern pro-western city. Plantaže, wine and brandy making company, are still among the biggest companies in Podgorica. In the 2000s, Podgorica witnessed a rapid expansion of its financial and service sector, and its economy transformed into a more service-oriented one. The two stock markets situated in Podgorica (Montenegro and NEX) today have a daily turnover bigger than stock exchanges in much larger cities. Today, economic activities in Podgorica had mostly shifted from heavy industries towards telecommunications, construction and banking. The increasing number of investors and foreign companies that are opening outlets in Podgorica add significantly to the growth and diversification of Podgorica’s economy. As a side effect, this has skyrocketed the prices of real estate and development land in the center of Podgorica. This is expected to continue, as Podgorica became the capital of a sovereign state in 2006. Podgorica is located in central Montenegro, in northern part of Zeta plain. The entire area in which Podgorica is located is intersected with rivers, and the city itself is located only 15 km north of the Skadarsko Jezero, Moraca and Ribnica rivers flow through the city, while Zeta, Cijevna, Sitnica, Mareza rivers flow in the vicinity of the city. One of the main features of the city is richness in bodies of water. The city itself, in contrast to most of Montenegro, is lying on predominantly flat area of northern Zeta plain. Only exceptions are hills that overlook the city. The most significant is the Gorica Hill, 107 meter tall hill that rises above the very city center, and after which the city got its name. Some of other hills are named Malo brdo (Little hill), Velje brdo (Big hill), Ljubovic, Cardak, etc. These are mostly steep hills that rise abruptly from the surface, and thus are not suitable for urbanisation. They rather limit the city’s expansion, especially to the north, shaping the city’s development. Podgorica has typical Mediterranean climate, with hot and dry summers, and mild winters. Snow is almost unknown phenomena in Podgorica. It has a mean annual rainfall of 1544 mm, and median daily temperature of 16,4°C. It has around 135 days with temperature higher than 25°C per annum. Podgorica is particularly known for extremely hot summers, as temperatures over 40° C are a common occurrence in July and August. Absolute maximum recorded in Podgorica is 44.8 °C, on 16th August 2007. Podgorica is home to many Montenegrin cultural institutions and events. It hosts the Montenegrin National Theater and a number of museums and galleries. The Montenegrin National Theater is the most famous theater not only in Podgorica, but in all of Montenegro. Most of the Montenegrin high education establishment are located in Podgorica. It is the home of University of Montenegro, the most significant institution for high education in Montenegro. Montenegrin Academy of Sciences and Arts is also located in Podgorica, as well as DANU cultural organization. In recent years, the number of private institutions for higher education have emerged, further expanding the educational possibilities in Podgorica. Podgorica municipality has 34 elementary schools and 10 secondary education schools, including one gymnasium. The Radosav Ljumovic national library is considered to be the most comprehensive library in Montenegro. In accordance with city’s and country’s turbulent history, Podgorica is mixture of various architectural styles. Whenever the rule and regime changed, which in Podgorica occurred frequently, the architectural style typical for that regime was applied. As Podgorica was incorporated into Ottoman Empire until 1878, there are many remnants of Turkish architecture. Oldest parts of modern Podgorica, Stara Varoš (Old town) and Drac, are typical representatives of this, with two mosques, Turkish clock tower (Sahat Kula) and narrow, curvy streets throughout the neighborhoods. With Podgorica being incorporated in Montenegro, the urban core shifted to the other bank of Ribnica river, where the town developed in European-oriented way, with wider streets intersecting at right angles. During World War II, Podgorica was almost razed to the ground, being bombed over 70 times. After the liberation, the rebuilding began in a similar way to other cities in communist-ruled SFRY. Mass residential blocks were erected, with basic design typical for countries of Eastern bloc. The entire part of the city on the right bank of Moraca river was built in this way. Even the empty spaces in the city center were filled with near-brutalist structures, resulting in an unfortunate fusion of old and the new. The residential and business blocks erected during the existence of SFRY provided the more-than-necessary housing for Podgorica citizens after the war, but they are heavily criticized for the uninventive and grey looks they incorporate. The major advance in architecture of Podgorica began in late 1990s and since then the city’s face changed rapidly. Apartment buildings and business blocks are erected rapidly, and they incorporate the modern all-glass-and-steel looks. Public spaces in Podgorica are heavily invested in, so the city got many entirely new squares, parks and monuments. Some of the new landmarks have been emerging, such as Hristovog Vaskrsenja orthodox temple and the premium feature of Podgorica skyline, The Millennium Bridge. Podgorica is today in process of rapid transformation from featureless town to modern European capital. Podgorica is the economic heart of Montenegro, all business, industrial production and commerce of the country largely takes place here. The current economic prosperity of Podgorica fits in the history of the city. When Montenegro was part of the former Yugoslavia, Podgorica was the most economically viable city in the country. Although it is not a tourist city, you may wonder if you can find nice accommodation, but rest assured. Podgorica is the capital of Montenegro and hosts many diplomats and business meetings, which means that you will find some top locations to stay. The larger leading hotel chains such as Hilton, Best Western and Ramada may not be missed. But it is not only luxury business hotels, but also a few places that are ideal for families with play areas and swimming pools. Most hotels are in the central city and the beauty of Podgorica is that it is so compact and easy to find and taxi prices are lower than in the other parts of Montenegro. Best Hotels in Podgorica € 0 – € 60 per night. Hotel Laguna – The family-run Hotel Laguna is situated in a quiet location in Podgorica, about a 3-minute drive from the business district and a 5-minute drive from the city center. Wi-Fi and parking are free. All rooms feature wooden floors, a flat-screen TV with cable channels, a seating area and a minibar. The private bathrooms include a bath or shower, hairdryer and free toiletries.The Laguna’s cozy restaurant has a spacious summer terrace. Local and international dishes are served, as well as a selection of local wines. At breakfast you can make a choice of the card. Podgorica Airport is only a 12-minute drive away. Facilities : Free Wi-Fi, On-site parking, Pets Allowed, Breakfast options, Breakfast in the room, On-site coffee house, Restaurant (à la carte), Accessible parking, Car hire, Private check-in / check-out, Luggage storage, Tour desk, 24-hour front desk, Dry cleaning ( surcharge, Laundry service (surcharge), Ironing service (surcharge), Airport shuttle. Aurel Hotel – Hotel Aurel is located in the new business district of Podgorica, 1 km from the city center. The hotel offers a restaurant with a terrace, a gym and a spa. Free WiFi is available throughout and there is free parking in a garage. All air-conditioned rooms include a flat-screen TV, a minibar and a private bathroom with a shower, bathrobe and slippers. Some rooms also offer a balcony with views of the city. The rooms are decorated in soft tones and are equipped with lots of light. On the restaurant terrace you can enjoy international cuisine, various domestic specialties and a buffet breakfast. The Aurel’s spa area includes a hot tub, a sauna and a steam bath. The center of Podgorica is a short walk away. Here you will find plenty of bars, restaurants and shops. There is also a nightclub in the center of town. The Main Bus Station is 1 km away and Podgorica Airport is 11 km away. The hotel offers free and on request (at least 24 hours in advance) transfer from / to airport. Facilities : ree Wi-Fi, Free Parking, Accessible Parking, Terrace, Massage (surcharge), Spa & Wellness Center, Sauna, Fitness Center, Hot Tub / Jacuzzi, Restaurant (à la carte and buffet), Bar, Breakfast in the Room, Wheelchair Accessible, Concierge Service, Luggage Storage, Express Check-In / Check-Out, 24-Hour Front Desk, Ironing Service (surcharge), Laundry (surcharge), Meeting / Banquet Facilities. Hotel Crnogorska Kuca – Hotel Crnogorska Kuća enjoys a quiet location 2.5 km from the center of Podgorica and features an à la carte restaurant. It offers modern air-conditioned rooms with free Wi-Fi. Free private parking is available. All rooms feature a flat-screen TV with satellite channels, a fridge and a desk. The private bathrooms include a shower, hairdryer and towels. The restaurant at Hotel Crnogorska Kuća is decorated in a traditional style and serves local specialties. Various massages can be arranged at a surcharge. Facilities : Free Wi-Fi, Free Parking, Restaurant (à la carte), Terrace, Garden, Private Check-in / -out, Room Service, Breakfast in the Room, Safety Deposit Box. Best Hotels in Podgorica € 60 + per night. Hotel Ziya – The 5-star Hotel Ziya is located 100 meters from Podgorica town center. The hotel has a spa center with a hot tub and sauna. Guests can use the indoor pool for free. It offers modern air-conditioned rooms with free Wi-Fi. You can start the day with an extensive continental breakfast. The hotel’s à la carte restaurant is open throughout the day. The luxurious rooms feature an LCD TV with cable channels, soundproofed windows and a spacious bathroom with toiletries. Free private parking is available in front of the hotel. Facilities : Free Wi-Fi, Free Parking, Terrace, Garden, Indoor Swimming Pool, Massage (surcharge), Fitness Center, Hot Tub / Jacuzzi, Sauna, Spa & Wellness Center, Restaurant (à la carte), Breakfast in the Room, Bar, Concierge Service, Luggage Storage, 24-Hour Front Desk Newspapers, Ironing Service (surcharge), Laundry (surcharge), Dry Cleaning (surcharge), Meeting / Banquet Facilities, VIP Room Facilities. Hotel Ramada – Ramada Podgorica is connected to the popular shopping center of Montenegro and is located in the heart of the capital. It offers stylish interiors, a wellness center and an elegant restaurant with panoramic views of the top floor. Each of the modern-style rooms and suites comes with free Wi-Fi and an LCD satellite TV as standard. The spacious and luxurious units at Ramada Podgorica all have individually controlled air conditioning and a minibar. The private bathroom includes bathrobes and slippers. The hotel’s restaurant features floor-to-ceiling windows and a terrace with far-reaching views of Podgorica. It serves a variety of international specialties. At the spa you can go for the sauna, steam bath and tanning beds and there are also massages available and a gym. Facilities : Free Wi-Fi, Free Parking, Terrace, Spa & Wellness Center (surcharge), Sauna (surcharge), Fitness Center, Snack Bar, Breakfast in the Room, Bar, Restaurant (à la carte and buffet), Ironing Service (surcharge), Dry Cleaning (surcharge) ), Business Center, Meeting / Banquet Facilities, Airport Shuttle, Car Hire, Safety Deposit Box, Luggage Storage, Express Check-In / Check-Out, 24-Hour Front Desk. Hotel M Nikic – The 4 + star Hotel M Nikić is centrally located in Podgorica, near the River Ribnica and the old town. It offers free parking, free Wi-Fi, air-conditioned rooms and an à la carte restaurant. All rooms offer views of the river and city, a minibar, a safety deposit box and an LED TV with cable channels. The private bathrooms include bathrobes and slippers. You can make free use of the modern fitness center Life Fitness, the internet room with printer and the book collection with famous works by national and international writers. The on-site restaurant serves Montenegrin specialties and international dishes. The property also features a bar, a souvenir shop, and a laundry and ironing service. The Morača River, where you can go fishing, is 300 meters away. The spa center is 600 meters away. Facilities : Free Wi-Fi, Free Parking, Fitness Center, Bar, Restaurant (à la carte and buffet), Accessible Parking, Concierge Service, ATM / Cash Machine on site, Luggage Storage, Express Check-In / Check-Out, 4-Hour Front Desk, Ironing Service (surcharge), Laundry ( surcharge, Business Center, Meeting / Banquet Facilities, VIP Room Facilities. Apartments Athos – Located in the center of Podgorica, Apartments Athos is set in a building from 2013 and offers air-conditioned accommodation with free WiFi and an on-site restaurant. The property has a lift, making it easily accessible for people with disabilities. All units include a flat-screen TV with cable channels, a kitchen with a dishwasher, and a bathroom with a washing machine, a shower and a hairdryer. A bar, a grocery store and various restaurants can be found within a radius of 100 meters. 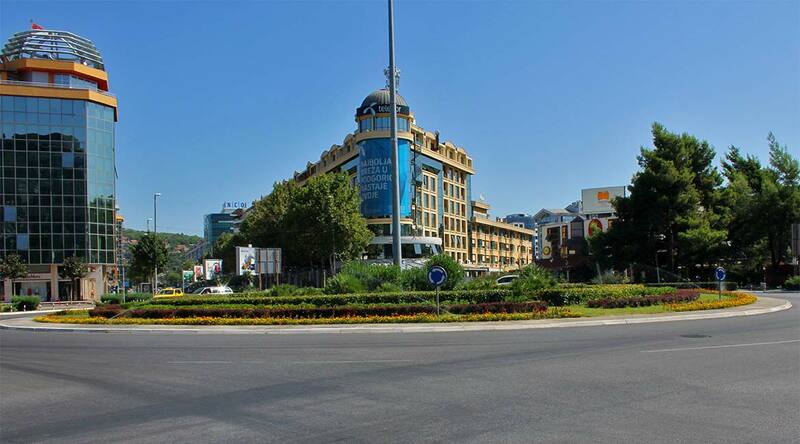 A large shopping center is about 500 meters away. There is a beauty salon near the property. The center of Podgorica offers various historical sights such as the Saborni hram Hristovog Vaskresenja. Apartments Aleksandra – Apartments Aleksandra is a self-catering accommodation located in Podgorica. This air-conditioned accommodation features a furnished balcony with garden views. Free Wi-Fi is available throughout and free parking is available on site. The apartment features a seating area and a TV with satellite channels. There is a fully equipped kitchen with a dishwasher and an oven. The private bathroom comes with a bath or shower and a hairdryer. For guests who wish to explore the area, the Modern Art Gallery is just 700 meters from the apartment and the Delta shopping center with its restaurants and shops is a 3-minute walk away. Facilities : Free Wi-Fi, Free Parking, Garden, Ironing Facilities, Safety Deposit Box. Montenegro Hostel Podgorica – All rooms are air-conditioned and have a patio. The private bathroom includes a bathtub or shower. At Montenegro Hostel you will find a 24-hour front desk, a garden and barbecue facilities. Other facilities offered at the property include a shared lounge, a tour desk and luggage storage. Activities in the surrounding area include cycling. Free parking is available on site. The hostel is 300 meters from the bell tower in Podgorica, 400 meters from the Parliament of Montenegro and 900 meters from the Millennium Bridge. The property is 10 km from Podgorica Airport. Facilities : Free Wi-Fi, Free Parking, Breakfast Options, Terrace, Outdoor furniture, BBQ Facilities, Garden, Bicycle Rental (surcharge), Car Hire, Luggage Lockers, Luggage Storage, Tour Desk, 24-Hour Front Desk, Ironing Service, Laundry, Wake Up Service, Airport Shuttle. Besides being the capital of Montenegro, Podgorica is also the country’s largest city, having a population of some 200,000 people. The city is situated in central Montenegro, in the scarce Montenegrin lowlands between the Dinaric Alps and the Skadarsko Jezero. The Podgorica area has been continuously inhabited since the Illyrian and Roman eras, with settlement on the site of today’s Podgorica being firmly established during Ottoman Empire rule. Podgorica was reincorporated in Montenegro in 1878, when the city started to take a more European shape. Nazi and Allied bombings during World War II destroyed much of the historical Ottoman and Montenegro-era Podgorica architecture, and city was reborn as the capital of Montenegro in Socialist Yugoslavia (SFRY). The city was then rebuilt and expanded in a manner typical of Eastern bloc countries, so it is mostly a modern planned city, and by no means a principal sightseeing destination. While not a typical European eye candy, the city is definitely worth visiting, owing to its interesting mix of old and new, its café culture and nightlife, and its laid back Mediterranean atmosphere. Both Montenegrin coastal cities and its mountain resorts are within one hour’s drive from the city, so it is an excellent starting point for day trips to anywhere in Montenegro. Podgorica Airport (LYPG/TGD) is situated 12 km (7.5 miles) south of Podgorica. It is a base for Montenegro Airlines, Montenegrin national carrier, which flies to major European destinations. For booking and flight schedule check the carrier website. For other airlines serving the airport, check the airport website. Combi buses operate to and from the city center, but may not be available at all times. Thus, probably the best bet is to take a taxi to the city, as taxis are to be found in abundance in front of the terminal. Taxi rides cost a flat rate €15 as per December 2009, but this should be confirmed with the taxi driver in advance (or there’s an Information desk in the airport who can tell you the current rate). As of 2012 it’s still said 15 € on the banners although you can easily get a cab no more than for 8 € or even less. There is regular passenger train service from Subotica through Novi Sad and Belgrade. Train tickets are cheap, but quality of service is lower comparing European standards. There are overnight trains with sleeping cars for around €25. Trains can be late but are a usual mean of transportation. Taxis will cost around €1,2 from train station to the center. Bus station serves number of domestic destinations, as well as those in neighboring countries. The bus and railway station are located next to each other. City center is 10 minutes walk from there, but if you have any luggage – it’s recommended that you either take a minibus(combi) or some of the taxis usually waiting at the station entrance. Walk — Podgorica is a medium-sized city of about 140,000 people. If your accommodation is near the city center, or the “Preko Morače” district – all points of interest could be visited on foot. Public transport — Public transportation consists of buses, that are not very frequent, and maps of the lines could be hard to locate. Ticket price is between €0.40 per single ride, and can be purchased on board, usually directly from the driver. Taxi — Probably the best option to move around Podgorica are cheap and reliable taxi service. There are over 20 taxicab companies, that usually operate new air-conditioned European sedans. Taxi stands are virtually everywhere in the city, but they could also be reached by calling the dispatcher. The fare is cca. 0.40€ per kilometer, and usually no start fare is charged. Considering the size of Podgorica – no drive within the city should cost more than €3 or €4. Old Turkish town — called “Stara Varoš” (“old town”), with its mosques and old clock tower. A typical old turkish “kasaba”(town), with narrow and curvy streets. Frankly, there are only few sights in this old town, in comparison with other cities in Montenegro. Skaline — (the stairs) on the outfall of the Ribnica river to Morača, with its old turkish bridge over the Ribnica, and the ruins of old Nemanja’s town. Sahat Kula — Sahat Kula was built in 1667, by Adži-paša Osmanagić, a prominent citizen of Podgorica. According to the legend, the clock was brought from Italy. For a long time, it was the only public clock in the city. Monument to King Nikola — Monument in the park across the street from the Montenegro’s parliament. Hercegovačka pedestrian street — Street in the city centre. Trg Republike — The central square of the city, next to Hercegovačka street, a lot of life at the end of the day, when people finish to work. Lot of cheap restaurants and friendly people, a pleasant place to spend the first part of the evening. Millennium bridge — the impressive new bridge over the Morača river. King Nikola castle — turned into a museum (closed on weekends), and the surrounding park. Hristovog vaskrsenja church — Newly built orthodox church. Rimski Trg — the square in the new part of town. 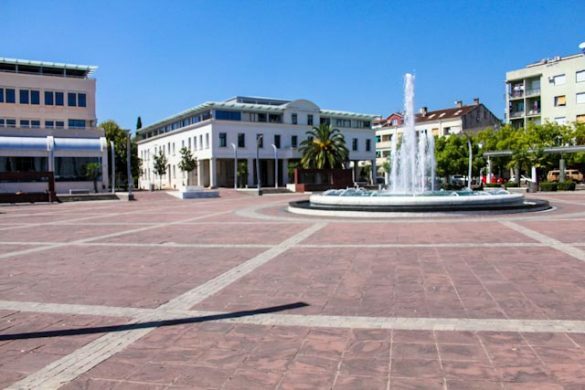 Located near the orthodox temple, the square and the surrounding area is the home for the trendiest of Podgorica cafes and restaurants, and favorite meeting point for Podgorica citizens. War memorial — in the park on Gorica Hill. While in Podgorica, one can enjoy the diversity of Montenegro’s capital cafes and restaurants, check out the nightlife, or take a walk at some of the favorite picnic locations of Podgorica citizens – Mareza, Skadarsko Jezero, or Gorica hill. While strolling through Podgorica center, you might find the shopping area interesting, as there is vast number of boutiques, just beware the counterfeits! Note that swimming in the Morača river might be a pleasant way to cool off in the summer months. The other option would be newly built open-air public swimming pools. Podgorica is also host to the City’s Theater, the Children’s Theater and the Puppet Theater, as well as to many smaller enthusiastic theater troupes. Although not as rich in museums and galleries as the historic royal capital Cetinje, there are several noteworthy museums, among which are the Podgorica City Museum, the Museum of Marko Miljanov and the Natural History Museum. Notable art galleries of Podgorica are Dvorac Petrovica (Petrovic’s Castle) and Perjanicki dom (House of the Honor Guard). The currency in Montenegro is the Euro (€). ATM’s are widespread in the city center and the new part of town. Upscale shops and restaurants will usually accept any major credit or debit cards. If you are coming in from neighboring tourist filled Croatia, the prices here will seem unbelievably low. There are a few shopping malls in Podgorica, most notably Delta City, a 48,000 sqm mall with over 70 stores, food court and a multiplex cinema, and Mall of Montenegro. There are also smaller malls, such as Palada and Nikić Center. Open markets on the outskirts of the city are a place to buy very cheap clothing, often of low quality. Touristic post cards seem to be not offered by shops in this city. Fellini — (Caffe Restaurant), Bulevar Sv. Petra Cetinjskog 153, +382 (0) 67 911 40 30, FELLINI is a convenient place for meetings and relaxation, an ideal place for rest and time for yourself, your friends and your loved ones. Pleasant modern interior in seductive tones of Fellini’s movie magic and a restaurant where everybody will just enjoy all the culinary delights Fellini offers. Buffet Pod Volat — Trg. Vojvode Becir Bega Osmanagic br.1, +382 (0) 69 666 622. Next to Sat Kula with a large garden under trees. Very quite place.Bosnian food in general. Salads and sweets as well.Priced slightly lower than center restaurants. Maša restaurant — Bulevar Sv. Petra Cetinjskog 31, +382 (0) 20 224 460. Renowned for its fresh seafood. Chinese Restaurant Zheng He — Vojvode Maša Đurovića 31 (City kvart), +382 (0) 20 223 551, New modest Chinese restaurant with excellent wine list. Carine Centar — Slobode 43, +382 (0) 20 402 400. The Carine Center features both the fine dining restaurant and the pizzeria. Probably the best pizza in town. Carine Moskovska — Moskovska 43, +382 (0) 20 402 400. The Carine Moskovska features both the national cuisine restaurant, and the pizzeria. Probably the best pizza in town. Salvador Dali — Džordža Vašingtona 87, +382 (0) 69 234 567. Newly open and chic restaurant, a favorite among local celebrities. Plantaže restaurant — Mareza bb (Mareza resort, few kilometers west of Podgorica), +382 (0) 20 268 722. A great place to eat. Hong Kong — Stanka Dragojevića 14, +382 (0) 20 667 300. Chinese food restaurant in Podgorica. Il Giardino — Rimski Trg 28, +382 (0) 69 313 313. Renowned for the Italian cuisine. Alpe Bar — Bulevar Sv. Petra Cetinjskog 88, +382 (0) 20 202 025. A pizzeria and a cafe, one of the city’s landmarks. Alpe Bar — Stanka Dragojevića 14, +382 (0) 20 665 771. Pizza Caffe — Oktobarske Revolucije 85, +382 (0) 20 625 325. Cheap Pizzas from 3-5€. Breaded chicken breast/thigh, pork chops (large portion) 3€, near Montenegro Hostel Podgorica approx 3min walk. Most popular fast food in Podgorica is hamburger (pleskavica), a Balkan hamburger somewhat differs from western. You can eat great hamburger, as well as anything made on the barbecue(roštilj) in places all across town, but best known and most visited are “Voda u kršu”, “Gurman”, “Calimero”, “Kruna”. There are no international fast food chains such as McDonalds, Burger King or KFC present in Podgorica. Drinking espresso or cappuccino on a sunny day in a cozy outdoor café is one of the favourite rituals of Podgorica’s residents. city. Most of the new and trendy cafes are located around “Vectra” district in the business part of the city. Modern design and relaxed atmosphere of the cafes coupled with Podgorica’s art of making espresso will make an interesting experience. Some of the well known cafes include: “Alpe bar”, “Buddha bar”, “Carine”, “Greenwich”, “Grand cafe”, Café”, “Soul II Soul” and many more. Soul2Soul — Njegoševa 34 (center). A classic Podgorica’s club that has been popular with the locals for years. Open throughout the entire year, with the front terrace being very busy in the summer months. Plays electronic music, most notably house and dance. Often hosts local DJs, who know how to move the crowd. Open until 03.00 on Fridays and Saturdays. Berlin — Njegoševa 24 (center). 09.00 – 03.00. An alternative pub in the city center, just a few steps away from the main Republic Square. Plays mostly alternative rock and pop music. Good vibe and relaxed atmosphere. Reasonably priced (draft Nikšićko beer at €1.30). Ragina glava (The Nag’s Head) — Bokeška 12. An English-style pub named after a bar that was featured in the popular BBC sitcom “Only Fools and Horses”. Plays mostly dance and pop music. Very popular with the younger generation. Good atmosphere, but it gets very crowded at weekends. Open until 03:00 Monday through Sunday. Tarantino — Bokeška 6. This is a pleasant bar to chill out and enjoy a relaxed afternoon or evening with friends over a pint of different types of beer. Also offers a number of cultural events such as cinema evenings and exhibitions. Open daily until 01:00. Clubs are most crowded from 11PM until 2AM on Friday and Saturday nights, but some get busy throughout the week as well. Some of the clubs may play folk music from former Yugoslav countries, which might be difficult for a foreigner to enjoy, so asking around for a recommendation could be useful. Njegos Mausoleum — The mausoleum of Petar Petrovic Njegos built of limestone and granite can be found on top of Mount Lovcen. It was Njegos’s last wish, the greatest ruler of the Montenegrins who was a bishop and a poet at the same time to be buried there. Kucka krajina — It is almost untouched, pristine, remote and quiet. Region called Kučka krajina or sometimes Žijovo (the Region of Kuči – a Montenegrin clan) situated north-east of Podgorica the capital of Montenegro, next to the Albanian border, is one of not so known gems of the Montenegrin Dinarids.